Find out more about the features of Garden Planner. When you buy garden planner you pay once and have it for ever. 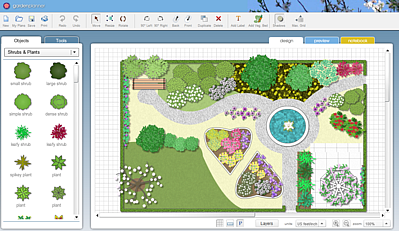 Garden Planner is also available to purchase on the Mac OSX store and Windows 10 store. The latest update to Garden Planner is now available. This update includes a bunch of new objects including six new trees. There are a number of additions and improvedmnents to the 3d view. You can now set transparency to any object. Plus it includes some bug fixes. Oh and one thing more...... from the Help menu you can now activate the 3d view of your garden. The 3d view will translate your 2d plan into a 3d world you can walk around. Why is this an option that you activate from the Help menu? Because at this stage the 3d view is still being developed with more objects and features being added regularly. So we are letting users choose if they want to use it right away (while there still a few objects missing) or you can wait for the final version that will come out soonish. Either way the 3d view, and all future updates are free for anyone who purchases garden planner. Users of previous versions can upgrade for free.